Living with a baby is both wildly exciting and totally mundane. From a bird’s-eye perspective, each day is a repeat of the one beforehand. We wake, eat breakfast, play, W sleeps, we go out to the shops or the park, eat lunch, W sleeps, S comes home from work, dinner, walk, sleep. There is washing to be done and nappies to be changed. But from up close, everything is unexpected. From week to week W develops new skills so that it feels like only yesterday she could barely roll over, and now she’s standing at the coffee table, grinning like a fool. And when she’s awake W is a ball of crazy movement – she’s crawling everywhere, getting her hands into all the tiny bits of dirt and electrical sockets she can find, standing up and falling back down again, pulling books off shelves and stuffing leaves into her mouth, demanding attention and being irresistibly cute. Within all of that (plus, you know, work, and all the other parts of life), there isn’t always a lot of time for involved cooking. Which is why my love for salads is standing me in good stead. Salads are, seriously, the best meals. There are endless variations – add legumes for protein, grains for roughage, fruit for sweet – and veggies are damn tasty. Plus you always feel good after eating a salad. 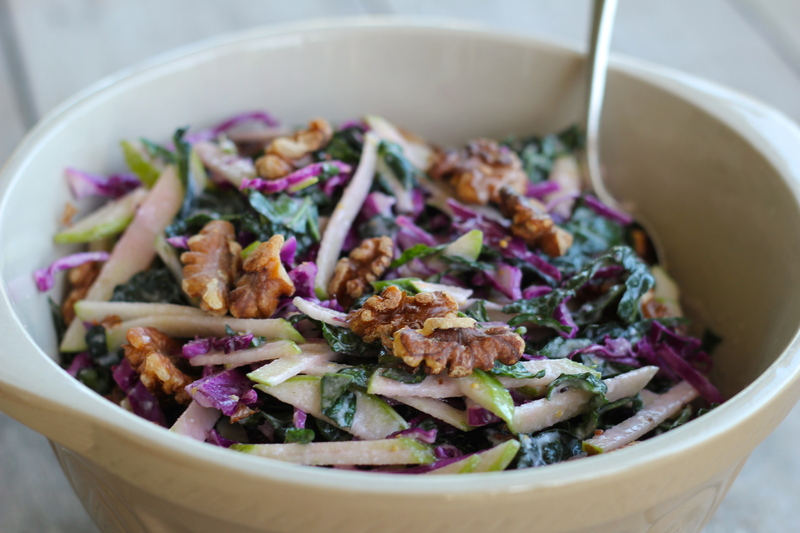 And this Kale & Purple Cabbage ‘Slaw is one of my new favourite combos. Although I’ve been eating kale for years, it was only this year that I started eating it raw in salads or pesto (my recipe for kale pesto coming soon). 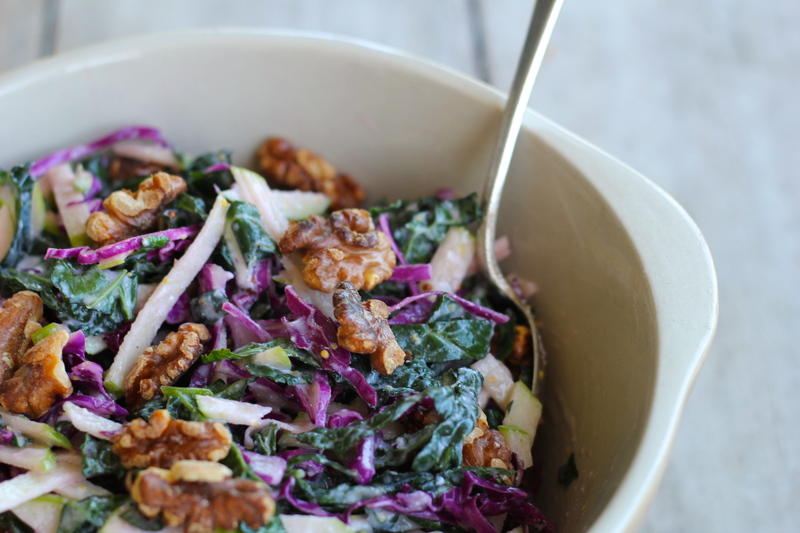 I love that it holds its shape in a salad, and that it is a superfood to boot. It can be slightly bitter raw, but marinating in lemon juice tempers that, as does the sweetness of the apple and the honey in the dressing of this salad. I’m not usually one for lots of salad dressing as I find it can drown the crispness of raw veggies, but as both kale and cabbage are so sturdy, the yoghurt dressing is the perfect outfit. Requiring no cooking and minimal prep, this salad is perfect to throw together for a Sunday lunch, or bring along to an evening barbecue. Heat oven to 200°c. Spread walnuts out on a tray and bake for 5 – 10 minutes, until they start to brown and smell toasty. Take out of the oven and leave to cool. Wash the kale and remove the stalks. Finely slice and place in a large bowl with the juice of half a lemon. Gently massage the kale with your fingers to really coat it in the juice, and leave covered for about 30 minutes. In the meantime, finely slice the purple cabbage and the apple (I use a mandoline for the apple). 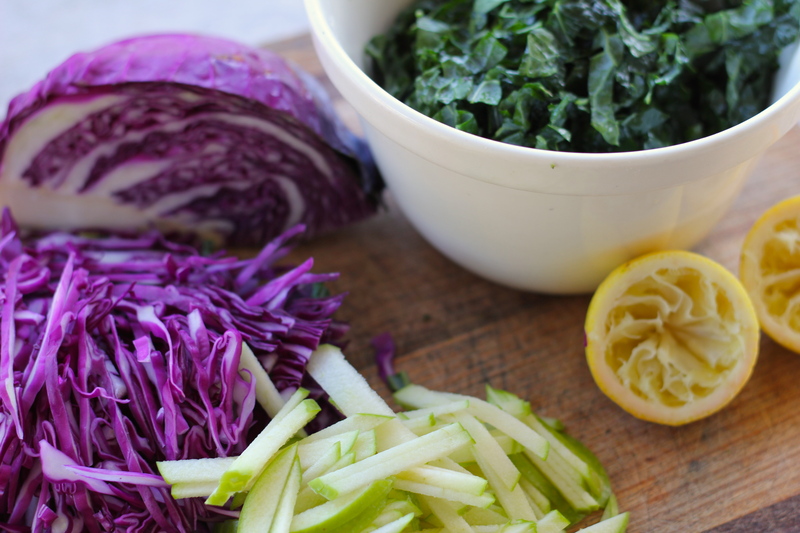 Once the kale has finished marinating, throw the cabbage and the apple in, and mix to combine. 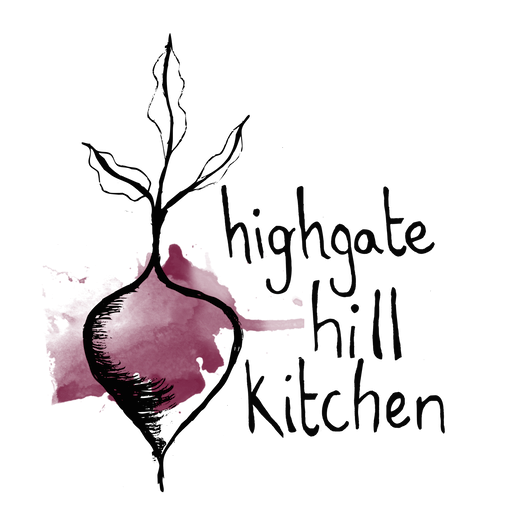 Prepare the dressing by whisking together the yoghurt, lemon juice, mustard, honey, sesame oil and salt. Pour the dressing over the salad and mix to thoroughly combine. Leave for an hour before eating to let the kale and cabbage soften. Before serving, top with the toasted walnuts. 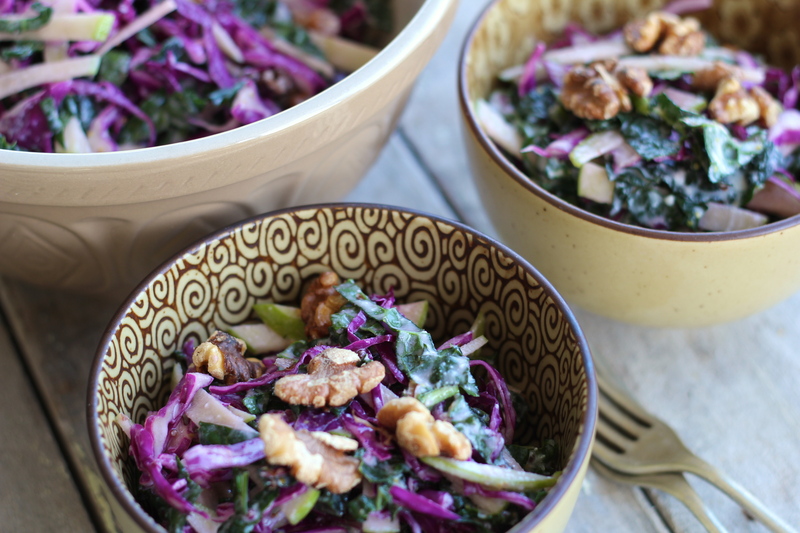 Notes: both kale and cabbage are pretty hearty, so this salad will stand up pretty well for two or three days in the fridge, although I’d recommend dressing it on the morning that you plan to eat it. It is also excellent with a poached egg on top if you’re looking for a bit of protein! 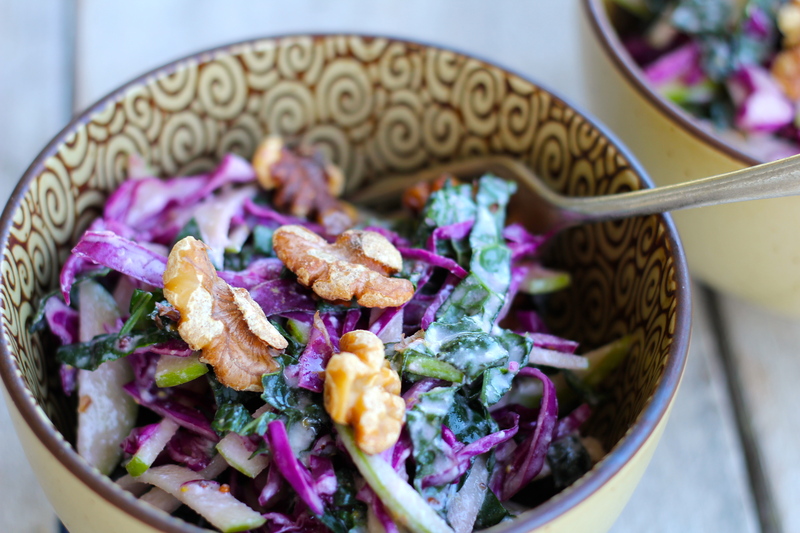 This is the most delicious slaw recipe I have ever made! And I have loved cooking for fifty years! Thanks Donna! So glad you enjoyed it.